Three days after the tragic Sutherland Springs church shooting on Nov. 5, 2017, in which 26 people died, USA Today published a video depicting various AR-15 accessories that the shooter could have used on his rifle. 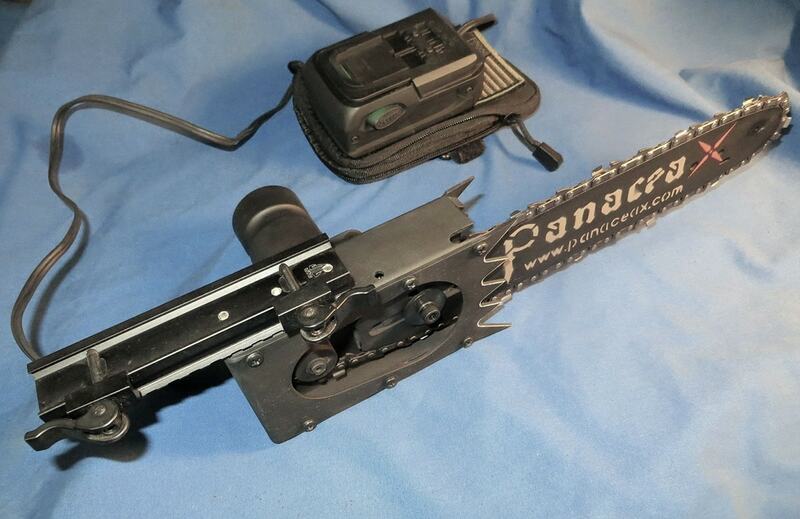 One such accessory was a chainsaw bayonet mounted under the barrel. Apparently, they thought that it was a common add-on. 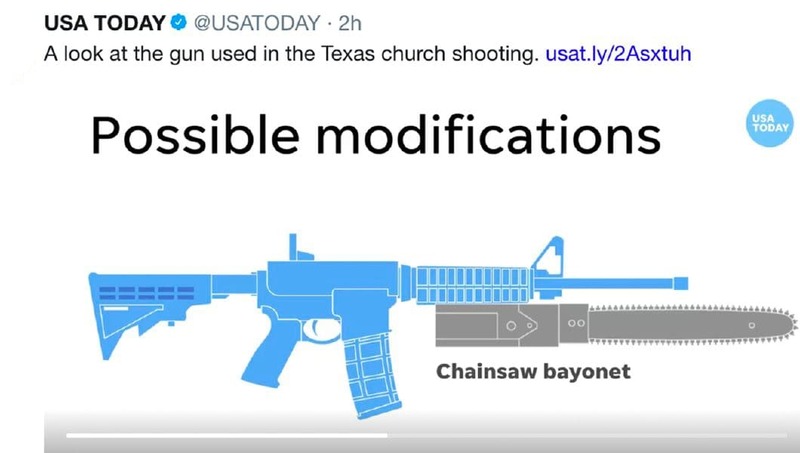 Up until then, most people didn’t even realize that an AR-15 chainsaw bayonet existed. It does, and it was invented by Robert Weir in 2012. 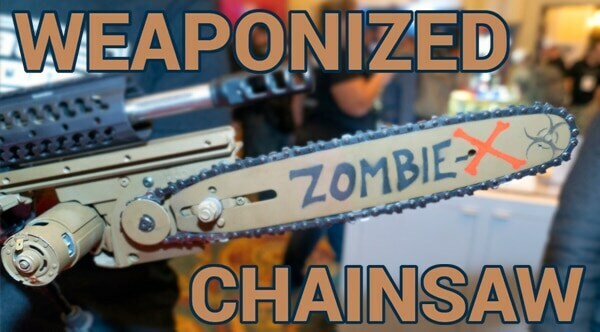 Weir, a metal craftsman, outdoorsman, inventor and entrepreneur, debuted a functioning model of his Zombie X Chainsaw Bayonet at SHOT Show in 2012. It consisted of a Picatinny rail mounted 10-inch electric chainsaw bayonet on an AK-47. A screenshot of the USA Today video. Originally, he intended it to be little more than publicity stunt to get people to stop by the DoubleStar booth where he worked. However, the chainsaw bayonet proved to be the center of attention. “I could see from the smiles and the glee on people’s faces that if we did not manufacture them, someone else was going to,” Weir says on his website. A few months later, he started a company called Panacea X, a Nevada based LLC. It’s main purpose was to bring the Zombie X Chainsaw to market. From 2012 to 2017, sales were fairly decent. Weir figures he sold approximately 100 units at $800 each. But when the USA Today article appeared on Nov. 8, 2017, his website traffic exploded. Unfortunately, he wasn’t prepared. Until then, the chainsaw bayonet was an underground niche item that sold a few units every month. Suddenly orders poured in and he wasn’t able to keep up. He sold what he had in stock and scrambled to produce new products. As of January, he was backordered two months. His success, and free marketing thanks to USA Today, saw Weir back at SHOT Show in January. He was announcing a new improved weaponized chainsaw that would be released in late spring. A few weeks ago, it was released. The Killsaw, as it’s called, features the same 10-inch blade as the original, but has a longer battery life, more power and a battery pack that can be mounted on the gun’s stock to help balance the weight of the rifle. It’s available here on his website for $800.